Before we go any further, thoughts and prayers go out to the family of Odin Lloyd, whose name has been mentioned roughly 1/1000th as much as the person who allegedly orchestrated his murder. That seems wrong to me, particularly since he is the one who is no longer living. For his family’s sake, I hope the perpetrators are brought to justice and given an appropriately harsh sentence. If you were a championship team that did only one thing well, you were going to get POUNDED. Hence the massive struggles for the ’06 Colts, ’76 Raiders, ’64 Browns and ’60 Eagles. Of course, I’d also like to think that part of the ’06 Colts’ offensive struggles stemmed from the fact that the simulation engine chose to run Dominic Rhodes and Joseph Addai as much it chose pass with PEYTON FREAKING MANNING. No big deal or anything. Jake Delhomme throws a ton of terrible interceptions at inopportune times. Clearly we could have only found this out via the WhatIf Sports sim engine. The Rams won fictional bragging rights as the greatest team of all time behind 141 yards and two touchdowns on 19 carries from Marshall Faulk and two turnovers from their defense. Faulk won MVP honors for his performance, scoring from 12 yards away in the second quarter and 13 yards away in the fourth. His first touchdown gave the Rams a 13-3 lead with about five minutes remaining in the first half, but Jacksonville responded with a one-yard touchdown pass from Mark Brunell to Jimmy Smith; Jeff Wilkins’ third field goal of the half subsequently gave the Rams a 16-10 lead going into halftime. Faulk’s second score then gave the Rams a 24-10 lead early in the fourth quarter; on the Rams’ next possession, Faulk scampered 71 yards to set up Kurt Warner’s 13-yard touchdown pass to Isaac Bruce, which put the Rams up 21 with a little over six minutes to play and essentially salted the game away. James Stewart scored on a five-yard touchdown run with under five minutes to play for Jacksonville, but the Jaguars couldn’t make any further push from there. So that’s it. The fictional season is done and soon the real 2013 regular season will be getting underway. We’ll be covering that in-depth in the coming weeks and months. You may note this is the first – and only – post I’ve made – or will make – this week on THIS HERE BLIGGITY BLOG. Between busy summer activities out in the physical world and an utter dearth of football-related stories out there right now (other than the potentially very serious and very sad investigation involving Aaron Hernandez), this has seemed like a pretty good week to recharge the batteries before gearing up to write the 2013 team previews for each team. Look for those to start appearing next month. However, I’m making a brief appearance this morning to post the results to the conference championship rounds of the Greatest of All Time season. Which NFC behemoth will make it to the fictional Super Bowl – the ’85 Bears or the ’99 Rams? And how much credibility will WhatIfSports.com lose if the ’99 Jaguars are somehow the team that ends up representing the AFC in the Super Bowl? We’ll find out the answers to those questions…right about now. Look, it doesn’t make sense to me, either, but the fact of the matter is Reggie Barlow caught a 19-yard touchdown pass from Mark Brunell as time expired to complete a 15-point comeback and shock the Patriots to make it to the Super Bowl. Brunell finished 16-of-25 for 250 yards and two fourth quarter touchdown passes that lifted the Jaguars over the Pats. New England had built up a 21-6 lead early in the third quarter thanks to touchdown passes from Tom Brady to Randy Moss and Kevin Faulk and a 34-yard touchdown run from Sammy Morris. After a Mike Hollis field goal late in the third quarter, however, Brunell’s touchdown toss to Jimmy Smith cut the score to 21-16 with 9:07 remaining. On their next possession, the Jaguars drove from their own eight-yard line to the Patriots 11 with a little over a minute and a half remaining, but New England tackled Keenan McCardell short of the first-down marker on fourth down to force a turnover on downs. The game looked over, but after Jacksonville forced a quick three-and-out (and exhausting their supply of timeouts in the process), the Jaguars got the ball back at New England’s 38 with 22 seconds left. Brunell hit Smith with a 15-yard gain, threw an incompletion, scrambled for five yards and then hit Barlow with the game-winning Hail Mary on the final play of the game. Would ESPN lose its mind over a real-life playoff game that ended on a successful Hail Mary? PERHAPS. Apparently the best football ever played occurred in 1999, as the Greatest Show on Turf moved on to the Super Bowl to take on the Jaguar team from that same year after a close win over the ’85 Bears. Marshall Faulk scored on consecutive 11 and 29 yard runs late in the fourth quarter to erase a seven-point deficit. The Rams had a 10-3 halftime lead thanks to a 65-yard touchdown pass from Kurt Warner to Torry Holt, but the Bears tied the game early in the second half on a 52-yard touchdown toss from Jim McMahon to Willie Gault. Then Walter Payton scored on a 4th-and-goal from the St. Louis 2 early in the fourth quarter to give the Bears a 17-10 lead. The Rams drove 78 yards on nine plays on their next possession, however, to tie the game up on Faulk’s 11-yard touchdown run. After the Bears went three-and-out, the Rams’ dominance on the ground continued with a four-play, 73-yard drive that all came on the ground, punctuated by Faulk’s 29-yard touchdown scamper. The Bears drove to the St. Louis 29 at the two-minute warning, but McMahon was picked off by real-life Super Bowl hero Mike Jones on second down to end the Bears’ last great hope. Next week: The culmination of the Greatest of All Time season occurs when the ’99 Jaguars take on the ’99 Rams. The second round of the Greatest of All Time playoffs comes today and, with it, a host of enticing fictional matchups for WhatIfSports to ponder and consider in its relatively infinite wisdom. The ’91 Redskins handed the ’99 Rams one of their only three losses during the regular season, but can they repeat that feat on the road? The ’92 Cowboys beat the ’85 Bears in Chicago during the regular season – will the Bears get a measure of revenge today in Texas Stadium? And will the ’79 Chargers win their fifteenth game in a row to get to the AFC Championship game? In a way, it’s possible that we’ll never know the true answers to those questions. In another, more factual way, we’ll find out the answers in a few seconds. Fred Taylor scored on touchdown runs of six and ten yards and the Jaguars outgained the Chargers 394-252 to score their second stunning upset in a row and move on to the AFC Championship next week. Taylor only rushed for a total of 38 yards on 14 carries, but James Stewart provided the main rushing push between the 20s, gaining 108 yards on 18 attempts. Mark Brunell added 229 passing yards on just 24 attempts – Jimmy Smith caught seven of Brunell’s passes for 97 yards. The Chargers led 3-0 after the first quarter, but Taylor finished off a six-play, 79-yard drive with his first touchdown on the first play of the second quarter. After receiving the second half kickoff up 10-9, the Jaguars went on a ten-play, 88-yard drive that lasted over six minutes and was capped by Taylor’s ten-yard touchdown run. Meanwhile, the Jaguars defense held Dan Fouts to a 16-of-33 day for 232 yards and gave up only 49 yards on the ground. Kurt Warner went 17-of-23 for 240 yards and three touchdown passes and the Rams easily avenged their regular season loss to the Redskins to move on to the NFC Championship. Washington limited Marshall Faulk to just 52 combined rushing and receiving yards on 17 touches, but the remainder of the Greatest Show on Turf cast picked up the slack as Torry Holt, Az-Zahir Hakim and Ricky Proehl all caught touchdown passes from Warner. Mark Rypien performed well in defeat for the Redskins, going 19-of-29 for 263 yards and no turnovers but Washington was only able to gain 78 yards on 33 rushing attempts, putting Rypien and the Redskin passing game behind the 8 ball too often on 3rd downs. Just like the Jaguars and Rams before them, the Bears avenged a regular season loss via 124 rushing yards and a touchdown from Walter Payton and a strong showing from their defense to beat the Cowboys on the road and advance to the NFC Championship Game next week. Dallas scored easily on the first possession of the game, moving 79 yards on just four plays to score on a 36-yard touchdown run from Curvin Richards. From then on, though, Dallas had major trouble moving the ball — Troy Aikman went only 12-of-24 for 157 yards and an interception and Emmitt Smith gained just 61 yards on 23 carries. The Bears took the lead late in the first half on a 2-yard touchdown run from Dennis Gentry and expanded it to 17-7 on Payton’s 34-yard touchdown run midway through the third quarter. From there, the Cowboys offense couldn’t move past the Bears 48-yard line and never seriously threatened to score. In a game marked by six lead changes, the Patriots got the last laugh on Stephen Gostkowski’s 42-yard field goal with no time left and defeated the Titans to advance to the AFC Championship Game. The field goal capped a wild fourth quarter that started with the Patriots clinging to a 10-9 lead. Al Del Greco’s fourth field goal of the game gave the Titans the lead back with 7:38 remaining, but after Laurence Maroney gained 43 yards on a pitch play, Tom Brady hit Kevin Faulk with a six-yard touchdown pass to give the Patriots a 17-12 lead with 5:42 left in the game. With under two minutes remaining, though, Steve McNair hit Carl Pickens with a 43-yard touchdown pass to give the Titans an 18-17 lead. Eddie George’s resulting two-point conversion attempt, however, was stopped short of the goal line and the Patriots got the ball back at their own 26-yard line with 1:10 remaining needing just a field goal for the win. After Brady hit Ben Watson with a 21-yard pass to convert a crucial third down with 27 seconds left, Gostkowski came on to kick his second field goal of the day. Next week: The playoffs begin to wind down with the conference championship games. The Redskins forced four Tampa Bay turnovers en route to a seventeen-point victory at Raymond James Stadium. Monte Coleman had two of the three interceptions for the Redskins, with Darrell Green claiming the other. Mike Alstott’s 1-yard touchdown run with under three minutes left in the second quarter gave the Bucs a 7-6 lead, but Ricky Ervins countered with a 43-yard touchdown scamper with just 24 seconds remaining in the half to give Washington a 13-7 lead going into halftime. From there, Earnest Byner scored on a six-yard touchdown run late in the third quarter and Mark Rypien threw an 11-yard touchdown pass to Gary Clark with a little over two minutes remaining to ice the victory. Clark finished with 79 yards receiving on five catches. Mark Brunell threw a three-yard touchdown pass to Jimmy Smith with 52 seconds remaining in the game and the Jaguars withstood one last Steeler charge to upset Pittsburgh at Three Rivers Stadium. Jacksonville received the ball down 14-13 with 3:10 remaining at their own 40 yard line after a Pittsburgh drive that had taken seven minutes off the clock ended with a missed 50-yard field goal by Roy Gerela. From there, Brunell hit Smith, Kyle Brady and James Stewart with passes that led to the eventual game-winning pass from Brunell to Smith. Terry Bradshaw led the Steelers to the Jacksonville 36 on the final play of the game, but his Hail Mary heave fell incomplete. Stewart started the scoring with a 1-yard touchdown run, but Pittsburgh responded shortly thereafter with a 32-yard touchdown pass from Bradshaw to John “Frenchy” Fuqua. After a Mike Hollis field goal gave the Jaguars a 10-7 lead going into halftime, the Steelers took the lead on a 29-yard pass from Bradshaw to Lynn Swann. The Steel Curtain defense ultimately couldn’t make the lead hold up, however. Steve McNair threw first-quarter touchdown passes of 12 yards to Yancey Thigpen and 56 yards to Frank Wycheck and the Titans shook off two losses to end the regular season to bounce back in the opening round of the playoffs against the ’72 Dolphins. McNair finished 13-of-25 for 201 yards and two touchdowns and Eddie George added 110 yards on 24 attempts. The Dolphins were able to hit some big plays, such as a 64-yard run by Paul Warfield on a reverse and an 84-yard pass play from Earl Morrall to Larry Csonka. But two interceptions and an abysmal 3rd-down performance (3-of-16) kept the Dolphins from scoring more than 3 points. Tennessee will now play the ’07 Patriots next week. Kevin Butler hit a 55-yard field goal almost nine minutes into the first overtime period and the Bears beat the Packers for the third time this season and advanced to play the ’92 Cowboys next week. Green Bay started the scoring with a two-yard touchdown pass from Bart Starr to Max McGee in the first quarter, but the Bears responded in the second with a nine-yard pass from Jim McMahon to Dennis McKinnon to tie the game at 7 going into halftime. And there the score stayed for nearly 39 minutes, as both teams frequently got to the edge of field goal range but mainly chose to punt rather than kick a very long field goal. The exception to this came in the fourth quarter when Butler missed a 54-yard attempt with 1:54 remaining. After the Packers had to punt right away, Dennis Gentry fumbled right away to give Green Bay the ball at the Chicago 47. But Starr gave the ball right back when his pass was intercepted by Richard Dent (who also had two sacks). Finally on their second possession in overtime, the Bears drove 26 yards in seven plays to get Butler a second chance at a long field goal. Walter Payton rushed for 132 yards on 25 carries for Chicago. Jim Taylor had 89 yards on 19 carries for Green Bay, but Starr was wildly ineffective, going only 10-of-31 for 69 yards, a touchdown and two interceptions. Next week: The following playoff matchups occur. Jacksonville gets in if they beat Tennessee. If they lose, they’re out. Simple enough. Miami already won in the results posted yesterday, so they get in the playoffs with some weird help: either a loss by Jacksonville or Denver or a Kansas City win by fewer than 36 points. Like I said: weird. Kansas City gets in with a 36-point or greater win over Minnesota or a win and a Jacksonville loss. If they lose, they’re out. Denver needs to beat New England and have Kansas City lose. If they lose, they’re out. Baltimore won yesterday and would make the playoffs if Jacksonville, Kansas City and Denver all lose. Given the quality of teams that the Jaguars and Broncos are facing, it’s not beyond the realm of possibility. The Packers’ winless streak stretched to five games as Bobby Layne threw a 10-yard touchdown pass to Cloyce Box and Bob Hoernschemeyer subsequently added a two-point conversion to tie the game at 14 with under two minutes remaining in the fourth quarter. The Lions then had three different opportunities to win the game at the end of regulation and overtime, but Pat Harder missed field goals from 37, 41 and 54 yards away to leave the game deadlocked. Bart Starr went 19-of-27 for 233 yards for Green Bay; Layne finished 17-of-19 for 152 yards and a touchdown. The Packers are the #6 seed in the playoffs and will play the Bears for the third time this season next week in the wild-card round. Terry Bradshaw threw touchdown passes to Franco Harris and Lynn Swann, as the Steelers won their regular season finale at Three Rivers Stadium. The Steel Curtain defense added three interceptions off Frank Ryan, two of which came from Mike Wagner. Jim Brown scored the lone touchdown for Cleveland but only gained 71 yards on the ground. The Steelers will be the #4 seed in the AFC playoffs. Shaun Alexander rushed for 128 yards and a touchdown on 26 attempts as the Seahawks ended their season on a high note, getting above .500 for the first time all year. Matt Hasselbeck added 228 yards and touchdown passes to Bobby Engram and D.J. Hackett in his 33 pass attempts. Ken Anderson and Pete Johnson hooked up for the lone Cincinnati touchdown. James Stewart touchdown runs of 2 and 30 yards helped fuel a 17-point fourth quarter for the Jaguars, who clinched a wild-card berth and the #5 seed in the AFC playoffs with the win. They’ll play at Pittsburgh next week. The win also finished off a season sweep of the Titans, whose only other loss this year came by one point last week at the hands of the 14-1 Chargers. Tennessee started the scoring off with a Keith Embray sack of Mark Brunell in the end zone less than four minutes into the game and led by the baseball score of 5-3 going into the fourth quarter. But with less than eleven minutes left in the fourth quarter, Stewart scored on a gutsy 4th-and-goal call from the two-yard-line to culminate a nine-minute, 15-play, 84-yard drive for the Jaguars. Stewart added his 30-yard touchdown run on the next possession to give the Jaguars a commanding 17-5 lead with 6:57 to play – a lead they would not relinquish. The Titans now wait for the result of the Patriots-Broncos game to see if they have to play next weekend or not. Joe Montana went 17-of-20 for 201 yards and two touchdown passes to Tom Rathman as the 49ers scored three fourth-quarter touchdowns to beat the Cardinals in Glendale. Roger Craig and John Taylor added touchdown runs for the Niners. Kurt Warner went 20-of-30 for 298 yards and a touchdown but also two interceptions. Even with nothing to play for, the Chargers felt compelled to come up with late-game heroics again as Dan Fouts hit Charlie Joiner with an 8-yard touchdown pass with 19 seconds remaining to give the Chargers their 14th victory in a row. Clarence Williams and Mike Thomas added touchdown runs for San Diego. Mark Van Eeghen rushed for 142 yards and a touchdown on 19 attempts for Oakland. Stephen Gostkowski’s 44-yard field goal with three seconds remaining gave the Patriots the #2 seed and a first-round bye in the AFC playoffs and ensured Denver would not be a part of the postseason. New England had a 16-3 lead early in the third quarter thanks to three Gostkowski field goals and a 17-yard touchdown throw from Tom Brady to Wes Welker, but Terrell Davis’s 50-yard touchdown run midway through the third quarter cut the Pats’ lead to six. Then after a Jason Elam field goal, Glenn Cadrez picked off Brady and returned the interception 48 yards for a touchdown and 20-16 Broncos lead. With a little over three minutes remaining, however, Kevin Faulk scored on a three-yard touchdown run to put New England back up by three. Denver drove down for a 34-yard Elam field goal to tie the game back up with 46 seconds remaining, but Brady drove the Pats 46 yards in six plays to set up Gostkowski’s game-winner. Fran Tarkenton went 21-of-25 for 318 yards and three touchdowns (two through the air, one on the ground) as the Vikings scored 14 unanswered points in the fourth quarter to stun the Chiefs and send Miami to the playoffs. Tarkenton’s 8-yard touchdown run early in the fourth quarter tied the game up at 17 and on the ensuing possession, Tarkenton hit Carroll Dale with a 6-yard touchdown pass that proved to be the game-winner. Chuck Foreman only rushed for 30 yards on 15 attempts but caught five passes for 110 yards. Len Dawson only went 10-of-21 for 101 yards, a touchdown and two interceptions for Kansas City, who lost their fourth game out of five to fall out of the playoffs. Jacksonville controls their own destiny due to their 7-4 conference record, so a win against Tennessee and they’re in the playoffs. If they don’t beat the Titans, they’d still get into the playoffs if two out of the following three teams lose: Kansas City, Miami and Denver. Miami also controls their own destiny – sort of. They currently own the strength of victory tiebreaker over Kansas City, so a win over the Giants would virtually assure them a playoff spot. If they don’t win in New York, they’d also need losses from two out of the other three current 8-7 teams (Jacksonville, Denver, and Kansas City) as well as a Baltimore loss. Kansas City could make the playoffs with just a win over Minnesota – as long as they win by 23 or more points than Miami beats the Giants. Otherwise, they’ll need either Jacksonville or Miami to lose in conjunction with beating the Vikings to make the playoffs. If they lose against Minnesota – no playoffs. Denver needs a win against the Patriots and either a Kansas City loss or losses by Jacksonville and Miami to make the playoffs. If they’re able to finish ahead of the Chiefs in the standings, the Broncos would own the common games tiebreaker over the Dolphins. If the Broncos lose to the Patriots – no playoffs. Baltimore is somehow still alive, thanks to their 6-5 conference record. If they beat the Jets, there are some far-flung scenarios involving most or all the 8-7 teams losing in which they make the playoffs. It’s a long shot, but it’s still on the table. Buffalo, Cincinnati and Houston have all been eliminated – they wouldn’t own any tiebreakers if they found themselves tied with other teams at 8-8. Got that all straight? Good, neither do I. Let’s start playing some (virtual) games! Larry Csonka rushed for 105 yards and two touchdowns on 17 attempts and the Dolphins held the Giants to 132 total yards of offense as they moved to 9-7 and came closer to clinching a playoff berth. Miami also forced Phil Simms into throwing three interceptions and completing only seven of his nineteen passes for a total of 74 passing yards. Bob Griese only went 6-of-18 for 86 yards and two interceptions himself, but the No-Name Defense’s smothering play was enough to carry the Dolphins to victory. The Dolphins will now make the playoffs with either a Kansas City win in which the Chiefs win by 35 points or fewer or a Jacksonville or Denver loss. Johnny Unitas went 17-of-26 for 193 yards and two touchdowns and the Colts won the Weeb Ewbank Bowl to move to 8-8 and keep their very slight playoff hopes alive. Baltimore also forced Joe Namath into tossing three interceptions, including a pick-six to Carl Taseff in the first quarter to start the scoring. The Colts now need Jacksonville, Kansas City and Denver to all lose to make the playoffs. The Rams clinched home-field advantage throughout the NFC playoffs with a blowout win at Atlanta. Kurt Warner went 15-of-21 for 277 yards and a 20-yard touchdown pass to Isaac Bruce in the third quarter that made the score 24-3. Marshall Faulk, James Hodgins and Justin Watson all added rushing touchdowns for St. Louis. Matt Suhey was the offensive star for the Bears in the regular season finale, scoring two touchdowns on the ground and adding a 40-yard touchdown catch as a receiver as the Bears won their fifth game in a row to finish at 11-5. Jim McMahon went 13-of-21 for 242 yards and two touchdowns and Walter Payton was both the Bears leading rusher and receiver, ending up with 138 yards from scrimmage. Drew Brees threw for 205 yards and two touchdowns on 25 attempts for the Saints. Mark Rypien went 15-of-23 for 179 yards, two touchdowns and two interceptions as the Redskins scored 17 fourth quarter points to win at home against the Bills. Washington clinched the #5 seed in the playoffs in the process and will face the NFC South champion in the first round. Earnest Byner rushed for 88 yards and added the game-clinching 8-yard touchdown catch late in the fourth quarter. Thurman Thomas had two rushing touchdowns for Buffalo in a losing cause. The Buccaneers took advantage of Bad Jake Delhomme and rode a five interception performance (along with a 56-yard touchdown pass from Brad Johnson to Michael Pittman) to the victory and the NFC South title. Tampa Bay will play the Redskins in the Wild-Card Round next week. The timing of Delhomme’s interceptions couldn’t possibly have been much worse: his first pick happened in the first quarter at the Tampa 23-yard line, followed by picks in the third quarter at his own 22 (leading to a Martin Gramatica field goal) and the Tampa 8 on a 2nd-and-goal play. Then to top it all off, Delhomme threw interceptions from the Tampa 13 and the Tampa 37 on back-to-back possessions and ENDED THE GAME by scrambling out of bounds for no gain from the Tampa 43. If you can think of a worse possible quarterback performance in a big game, I’d love to hear it. Emmitt Smith rushed for 153 yards and three touchdowns on 27 attempts as the Cowboys fought through a lackluster start to score 24 points in the fourth quarter and blow out the Eagles. Dallas sacked Norm Van Brocklin seven times (three by Jim Jeffcoat and two by Tony Tolbert) and picked him off three times, including a Larry Brown pick-six in the fourth quarter. Dallas is the #2 seed in the NFC and will have next weekend off. Philadelphia, meanwhile, clinched the worst record in the league and the #1 pick in next year’s draft…if there was a draft, which there isn’t. Peyton Manning threw for 185 yards and two touchdown passes to Marvin Harrison in 21 attempts and the Colts beat the Oilers in Houston. Joseph Addai added 151 yards and a touchdown on 14 rushing attempts. Warren Moon threw for 244 yards and two touchdowns on 28 attempts but also threw two interceptions. Tomorrow: The regular season concludes with the two wild-card spots and #2 seed in the AFC being decided. The first half of this week’s results were posted yesterday. The results of the last eight games of Week 16 shall be revealed…well, now. For the second time this year, the Dolphins beat the Jets with an overtime touchdown run, this time by Mercury Morris from 21 yards away 11 minutes into the overtime period as Miami kept their wild-card hopes alive. Miami actually should have won the game in regulation after Bob Griese hit Paul Warfield with a 57-yard gain down to the New York 15-yard-line with under two minutes remaining in the fourth quarter. But on the very next play, Griese was picked off by Jim Hudson and the game went to an extra period, Griese threw for 214 yards on 25 attempts but was very inconsistent, completing only ten passes and throwing two interceptions overall. Joe Namath actually performed worse, however, going 11-of-25 for just 122 yards and two interceptions. Warren Moon threw for 228 yards and two touchdowns on 27 attempts and the Oilers threw the Jaguars’ wild-card hopes to a perilous place by virtue of their lopsided win at the Astrodome. Allen Pinkett added 106 yards, ten of which came on a touchdown run late in the first half, on 17 attempts. James Stewart scored two rushing touchdowns for Jacksonville, who still controls its own destiny for the final wild-card slot but must host co-AFC leader Tennessee in its final game of the season. Artie Owens scored on a 6-yard touchdown run with 2:27 remaining and the Chargers used the aid of two devastating Titans turnovers to come back from a 17-point third quarter deficit and clinch home field advantage throughout the playoffs. 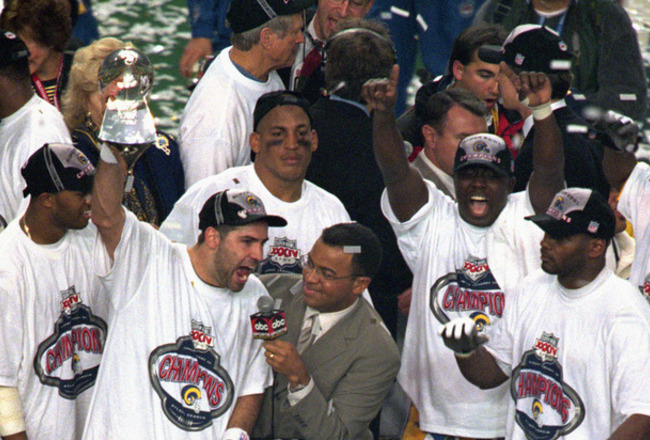 The San Diego comeback began on the final play of the third quarter, when Dan Fouts threw a 63-yard touchdown pass to John Jefferson to cut the deficit to 10 points. After an Al Del Greco field goal midway through the fourth quarter made the score 23-10, the Chargers ran Clarence Williams for 10 yards, Mike Thomas for 47, and Lydell Mitchell for 11 and a touchdown to come within six with under six minutes to play. On the first play of the Titans’ next possession, Steve McNair was intercepted by Woodrow Lowe, which set up a short field for Owens’ go-ahead score. The Titans drove deep into San Diego territory on the next possession, but Eddie George (who ran for 159 yards and a touchdown on 25 attempts) fumbled at the Charger 20-yard line and San Diego was able to run out the clock from there. The road to the AFC Championship now goes through San Diego; meanwhile, the Titans need either a win next week against the Jaguars or a Patriots loss to clinch the other first-round bye. Matt Ryan went 22-of-29 for 307 yards and three touchdowns and the Falcons beat the Cardinals at University of Phoenix Stadium. Roddy White caught two of Ryan’s touchdowns and Julio Jones the other. Kurt Warner threw touchdown passes to Larry Fitzgerald and Anquan Boldin but also threw two interceptions. Tom Brady had one of the best passing games of the season, going 24-of-29 for 358 yards and three touchdowns as he outdueled Peyton Manning to lead the Patriots to their 12th win of the season. Randy Moss had six catches for 134 yards and Wes Welker, Ben Watson and Donte Stallworth all caught touchdown passes from Brady. Facing a significantly tougher defense, Manning was nonetheless clearly inferior, going 16-of-32 for 220 yards and two garbage time touchdowns in the fourth quarter. The Patriots clinched at least the #3 seed in the AFC and, as noted in the Chargers-Titans recap, still have a shot at a first-round bye. Marshall Faulk rushed for 159 yards on 16 carries, including a 58-yard touchdown run early in the fourth quarter that gave the Rams a lead they would not relinquish. Kurt Warner only went 15-of-31 for 101 yards, a touchdown and three interceptions – the last of which set up the Steelers with a golden opportunity to retake the lead late in the fourth quarter. However, Roy Gerela missed his 36-yard attempt and would later miss a desperation 58-yard try in the waning seconds. Franco Harris was outstanding, rushing for 161 yards and a touchdown on 23 attempts, but Terry Bradshaw didn’t help through the air, going 10-of-27 for 96 yards and an interception. The win puts St. Louis in the driver’s seat for home-field advantage through the NFC playoffs. Shaun Alexander scored on a 3-yard touchdown run with 24 seconds remaining to cap a 10-point comeback in the last five minutes of the game and the Seahawks nipped the Panthers at Qwest Field. The Panthers’ loss clinched a wild-card slot for the Packers and now the only unknown playoff slot in the NFC is who will come out of the South. Carolina will play Tampa Bay next week in Charlotte to determine that final playoff team. Alexander’s touchdown was set up earlier by a 23-yard pass from Matt Hasselbeck to Joe Jurevicius on 4th-and-14. Fred Steinfort’s 24-yard field goal with 48 seconds remaining gave the Raiders the victory at the Oakland Coliseum and ruined a golden opportunity for their arch rivals to gain a leg up in the AFC wild-card chase. Warren McVea’s 46-yard touchdown run gave Kansas City a 17-10 lead early in the fourth quarter, but Mark Van Eeghen tied it up with a little over five minutes remaining with a 22-yard touchdown run of his own. Then after Len Dawson threw an interception in Oakland territory, Ken Stabler led the Raiders on an 11-play, 39-yard drive that culminated with Steinfort’s game-winning field goal. The loss actually moves Kansas City out of the playoffs for the moment, due to some complex tiebreakers that I’ll explain before next week’s games. Jim Brown gained 122 on 23 carries, scoring on runs from 54 and 12 yards and the Browns scored 21 unanswered points in the second half to win only their second game of the season. Ernie Green added 97 yards and a touchdown on ten carries. Roger Craig rushed for 118 yards for the 49ers, but Joe Montana threw two damaging interceptions. Brad Johnson went 21-of-28 for 246 yards and a touchdown and the Buccaneers snapped the Cowboys’ long winning streak and kept themselves right in the thick of the playoff chase. Keyshawn Johnson had 92 receiving yards and the only receiving touchdown of the game – a 32-yard catch from Brad Johnson in the second quarter. The Bucs’ Cover-2 also limited Troy Aikman to one of his worst games of the season – 7-of-20 for 116 yards. Emmitt Smith rushed for 93 yards and a touchdown, but it wasn’t enough to keep the Cowboys from momentarily ceding control of the NFC home-field advantage race. Mark Rypien went 19-of-25 for 273 yards and three touchdowns and the Redskins gained 537 yards of offense to fuel a rout of the Saints at the Superdome. Rypien’s touchdowns went to Art Monk (who had a total of 95 receiving yards), Ricky Ervins and Earnest Byner (who also rushed for 164 yards on the ground). Gary Clark didn’t catch a touchdown from Rypien but was the Redskins’ leading receiver with 100 yards. Pierre Thomas rushed for two touchdowns for the Saints and Drew Brees threw for 240 yards on 24 attempts but also threw two interceptions. Joe Morris rushed for 133 yards on 25 carries and Maurice Carthon added a game-clinching 30-yard run in the fourth quarter as the Giants all but ended the Bills’ playoff chances with a 13-point victory in Buffalo. New York took the lead in the third quarter on a 13-yard pass from Stacy Robinson to Phil Simms and never relinquished it from there. Thurman Thomas got the scoring started in the first quarter with a 32-yard touchdown run but the Bills couldn’t score from then on. Chuck Foreman rushed for 141 yards and two touchdowns on 18 attempts as the Vikings built a 27-3 halftime advantage and weathered a second-half comeback from the Eagles to earn their fifth victory of the season. Fran Tarkenton added 239 passing yards and a touchdown to Stu Voigt in 25 attempts. Norm Van Brocklin threw touchdown passes to Pete Retzlaff and Bobby Walston in the second half to get the Eagles back into the game, but it wasn’t enough to keep the Eagles from falling to sole possession of the league’s worst record. John Elway threw touchdown passes to Ed McCaffrey and Shannon Sharpe and the Broncos stayed alive in the AFC wild-card race with a tight win over the Lions at Tiger Stadium. Elway threw for a total of 212 yards on only 22 attempts but also threw two interceptions to Jim David to keep the Lions in the game. With just under five minutes remaining in the game, Detroit had four chances to tie the game from inside the Broncos’ two-yard line but were shut down on three runs and an incomplete pass. Alan Ameche rushed for three touchdowns for the Colts and Steve Myhra kicked a 24-yard field goal less than six minutes into overtime to give the Colts a home win and put the Bengals’ playoff hopes on life support. The Bengals had driven 69 yards in 14 plays to tie the game with 11 seconds remaining on a 5-yard touchdown pass from Ken Anderson to Dan Ross and subsequent two-point conversion toss from Anderson to Pete Johnson. But on the second play of overtime, Ameche gained 35 yards on a draw play to put the Colts at the Bengals’ 25-yard line and the Colts were able to get into better position for the unreliable Myrha from there. In total, the Colts gained 248 yards on the ground on 48 carries. Kevin Butler’s 29-yard field goal with 1:19 remaining gave the Bears a one-point lead and after forcing four straight incompletions from Bart Starr, the Bears hung on for a season sweep of the Packers and the NFC North title. Green Bay scored two touchdowns within the first five minutes of the game – an 18-yard pass from Bart Starr to Boyd Dowler and then, after a Willie Wood interception of Jim McMahon, a 4-yard Jim Taylor run. But Jerry Kramer missed the extra point after the second touchdown and would later miss a 49-yard field goal attempt in the fourth quarter. So despite netting a safety after a sack of McMahon in the end zone in the third quarter, the Packers only led 18-16 with less than five minutes to play. The Bears then went on a 49-yard, 10-play drive to set Butler up for his fourth field goal of the game. The Packers now may have to take care of the 3-12 Lions at home next week in order to make the playoffs. Tomorrow: The ’72 Dolphins, ’99 Jaguars and ’69 Chiefs all try to net important wins in the AFC wild-card picture; the ’75 Steelers and ’99 Rams battle in what conceivably could be a Super Bowl preview; and the 13-1 ’79 Chargers and 13-1 ’00 Titans battle head-to-head in Nashville to decide who gets home-field advantage throughout the playoffs in the AFC. Joe Namath shook off four interceptions to throw a game-tying 27-yard touchdown pass to Don Maynard with 1:39 remaining and Jim Turner won the game with a 47-yard field goal with two seconds remaining as the Jets kept their pencil-thin playoff hopes alive for another week. Mel Blount and Glen Edwards each picked off Namath twice, but Namath led the Jets on a nine-play, 51-yard drive that culminated with that touchdown throw to Maynard. Joe Gilliam, playing in relief of Terry Bradshaw, led the Steelers to the edge of Roy Gerela’s field goal range, but Gerela’s 50-yard field goal attempt went wide right with 32 seconds to play. Then Namath completed three quick passes to George Sauer, Bill Mathis and Pete Lammons to set up Turner for the game-winner. The loss likely cements the Steelers in the #4 slot in the playoffs; they’re now a game behind the Patriots for the #3 slot and New England owns the tiebreaker due to their Week 2 win. 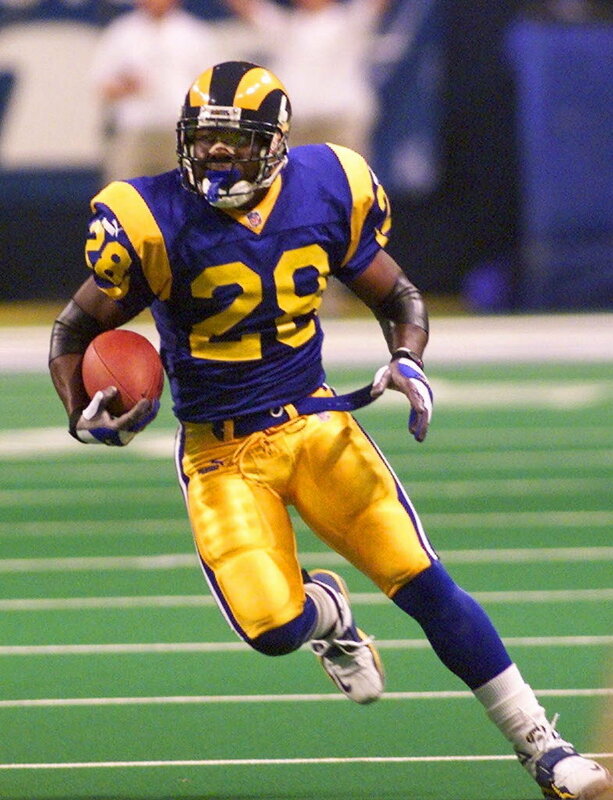 Marshall Faulk rushed for 140 yards on 14 attempts, including a 60-yard touchdown run in the first quarter and the Rams routed their greatest nemesis from the Greatest Show on Turf days, clinching a first-round bye in the process. Kurt Warner was efficient, going 10-of-14 for 177 yards and a 59-yard touchdown pass to Ricky Proehl (one can only assume that the entire Bucs secondary died on the play). Jeff Wilkins added six field goals for the Rams. Tampa Bay could only gain 76 rushing yards on 32 attempts and missed an opportunity to jump back into first place in the NFC South. As was expected in a battle of teams tied for the league’s best and worst records, respectively, the Titans rolled into Cleveland Stadium and took care of business, getting one step closer to clinching a first-round bye in the AFC. Steve McNair went 15-of-20 for 211 yards and a touchdown pass to Yancey Thigpen; Eddie George and Rodney Thomas added rushing touchdowns for Tennessee, as well. Jim Brown played well in defeat, rushing for 157 yards on 23 attempts; his quarterback, Frank Ryan, was miserable as usual, however, going 17-of-28 for 89 yards, a touchdown and an interception. Meanwhile in San Diego, 16 unanswered fourth quarter points culminating in a 13-yard touchdown pass from Dan Fouts to Charlie Joiner with seven seconds left also sent the Chargers to 13-1, setting up a winner-take-all showdown with Tennessee next week for home-field advantage in the AFC playoffs. When Ernest Givins caught an eight-yard score from Warren Moon to give Houston a 24-9 lead late in the third quarter, however, things weren’t looking bright for San Diego. Fouts, though, led the Chargers back with a 5-yard touchdown throw to Joiner early in the fourth quarter. Then, after a Rolf Benirschke field goal moved the score to 24-19, Fouts led the Chargers 44 yards in ten plays to win the game with his second touchdown pass to Joiner. San Diego failed to pick up the two-point conversion, but Houston was unable to run a play from scrimmage after the resulting kickoff. The loss all but ends the Oilers’ fading playoff dreams. The Cowboys clinched a season sweep of the Redskins, the NFC East title and a first-round bye in the NFC through stingy defense, 132 rushing yards and two touchdowns from Emmitt Smith and a 14-of-16 performance from Troy Aikman. Dallas kept Washington out of the end zone until the fourth quarter – by then, they had already built a 16-point advantage on three Lin Elliott field goals and Smith’s 2-yard touchdown run in the second quarter. After Mark Rypien’s 2-yard touchdown pass to Gary Clark cut the lead to 16-6, Smith put the game away with a 9-yard run with 1:46 remaining. Aikman finished with 147 yards on those 16 attempts; Rypien only threw for 174 yards on 25 attempts for the Redskins, who can now only make the playoffs through the wild card. Jug Girard caught a 9-yard touchdown pass from Bobby Layne with 14 seconds remaining to give the Lions the road victory. Girard also rushed for 85 yards on just seven attempts and Layne threw for 141 yards and two touchdowns on 20 attempts. Ken Stabler went 13-of-16 for 168 yards and a score for Oakland. Joe Morris took his turn swinging at the Eagles’ run defense pinata, rushing for 224 yards and four touchdowns on 24 carries as the Giants routed the Eagles at Giants Stadium. Morris scored on runs of 12, 20, 41, and 2 yards. Phil Simms added 198 passing yards and two touchdowns on 29 attempts. Backed by touchdown runs greater than 20 yards from Walter Payton and Matt Suhey, the Bears scored 20 unanswered points in the second half to clinch a season sweep of the Vikings and move into first place in the NFC North, due to their Week 5 win over Green Bay at Lambeau Field. The Bears could clinch the division by beating the Packers next week at Soldier Field. Payton finished with 121 yards on 18 attempts and Suhey added 77 on 11 carries. Fran Tarkenton was decent, going 18-of-30 for 192 yards and a touchdown, but the Vikings only gained 61 yards on the ground on 35 attempts. Next week: The NFC North likely gets decided when the ’62 Packers travel to face the ’85 Bears; the ’92 Cowboys and ’99 Rams try to keep up with each other in the race for home-field advantage in the NFC when they take on the ’02 Buccaneers and ’75 Steelers, respectively; and the ’79 Chargers and ’00 Titans decide who will be the #1 seed in the AFC when they meet in Nashville. Some notes on tiebreakers: Carolina is in the NFC South lead currently because they beat Tampa Bay back in Week 4 (they play again the final week of the season in Charlotte) and Chicago has the lead on the Bucs for the final wild-card spot because they have a better conference record…Dallas has the edge over St. Louis for home-field advantage in the NFC because they have a better conference record…Miami and Kansas City both currently have better division records than Buffalo and Denver, respectively, so the tie for the last AFC wild-card spot comes down to the Dolphins and Chiefs and the Dolphins currently have a better record than the Chiefs in common games…New England beat Pittsburgh back in Week 2, so they’re currently seeded #3 in the AFC as a result…And as far as Tennessee and San Diego are concerned, currently they’re so close in the standings that their tiebreaker goes down to such a weird, uncommon level that I’m not going to bother computing it – mainly because they play each other in Nashville in Week 16 and the tiebreaker will be slightly easier to comprehend after that. For now, I’m subjectively seeding the Titans #1. Robert Holmes’ nine-yard touchdown run early in the first quarter proved to be all the points the Chiefs needed, as they held the Jaguars to 178 total yards and came away with an important win in Jacksonville. Neither team’s quarterback had a good day: Len Dawson went 14-of-27 for 137 yards and two interceptions (and Mike Livingston came off the bench to throw another pick for the Chiefs), but Mark Brunell could only come up with 108 yards on 29 attempts and threw two interceptions of his own in addition to being sacked four times. Otis Taylor had 67 receiving yards for Kansas City. Shaun Alexander rushed for 149 yards and the game’s only touchdown on 22 attempts and the Seahawks likely ended the Colts’ playoff hopes with a seven-point win at Qwest Field. Baltimore had a chance in the waning seconds to tie the game, but Johnny Unitas’ last-ditch throw from the Seattle 16 fell incomplete. Baltimore outgained Seattle 275-230 and won the turnover battle 2-0, but could never punch the ball in the end zone and Steve Myhra’s field goal struggles continued as he missed two of his four attempts. Unitas finished 18-of-27 for 131 yards and no interceptions. Tom Brady went 24-of-32 for 311 yards and two touchdowns and the Patriots withstood a late Dolphins charge to come away with a road victory, a season sweep over Miami and the AFC East title all in one fell swoop. Brady threw a 64-yard touchdown pass to Kevin Faulk in the second quarter to give the Patriots a 14-3 lead and later threw a three-yard score to Ben Watson in the third to increase their lead to 24-10. The Dolphins came back in the fourth quarter, though, behind a Garo Yepremian field goal and Larry Csonka’s second touchdown run of the game which, after a successful two-point conversion, cut the Patriots’ lead to 24-21. But on Miami’s last possession, Howard Twilley fumbled the ball away at his own 41-yard line and the Patriots were able to run out the clock from there. Bob Griese played well for Miami in defeat, going 13-of-23 for 243 yards. For one of the few times this season, the Colts actually resembled the high-powered outfit that dominated the NFL’s regular seasons during the 2000s and it came at a terrible time for Denver, as the disappointing home loss dropped them a game in back of Kansas City in the wild-card race with two games to play. Peyton Manning went 16-of-27 for 260 yards and three touchdowns – two to Reggie Wayne and one to Marvin Harrison. Joseph Addai added 151 yards on 15 rushing attempts, including a long run of 58 yards. Terrell Davis continued the trend of rushers dominating the Colts’ run defense with 222 yards and three touchdowns on 23 attempts, but John Elway only went 8-of-13 for 84 yards and threw an interception. Matt Ryan went 17-of-23 for 189 yards and two touchdowns and the Falcons shocked the Panthers in Charlotte, bringing an end to Carolina’s five-game winning streak. Michael Turner added 102 yards on 13 rushing attempts and Atlanta’s pass rush got to Jake Delhomme seven times – John Abraham contributed two of those sacks. Jonathan Babineaux also recorded a sack and picked off Delhomme. The biggest shootout of the season was ultimately won by the home team, as Drew Brees went 21-of-29 for 387 yards and five touchdowns and the Saints outlasted the Cardinals at the Superdome. Here’s a partial list of the outstanding offensive performers from the game: Kurt Warner threw for 382 yards and four touchdowns on 36 attempts, Larry Fitzgerald had 157 receiving yards and a touchdown on seven catches, Edgerrin James rushed for 158 yards on 13 attempts, Reggie Bush scored three touchdowns (two on the ground, one through the air) and Marques Colston and Jeremy Shockey both had over 90 yards receiving. However, it was Jonathan Vilma’s second interception of the day that ended the Cardinals’ comeback threat with under a minute to go. Ken Anderson threw for 256 yards and two touchdowns on 26 attempts and the Bengals kept their playoff hopes alive while severely damaging Buffalo’s at the same time. Turk Schonert came on in relief of Anderson in the third quarter and added a touchdown throw to Steve Kreider which turned out to be the game-winner. Cris Collinsworth had 110 receiving yards on six catches and Dan Ross was the recipient of Anderson’s two touchdown tosses. Jim Kelly went 14-of-22 for 182 yards and two touchdowns but the Bills couldn’t get the ball back after scoring a touchdown with 4:31 remaining in the game. In a game filled with more Hall of Famers than you could count on both hands and toes, it turned out to be Terrence Flagler of all people who scored the lone touchdown of the game and gave the 49ers their third win in a row and the Packers their third loss in a row. Joe Montana went 15-of-23 for 187 yards and an interception and Jerry Rice caught three passes for 80 yards. With under a minute left, Green Bay drove down to the 49er 9-yard-line, but Bart Starr’s 4th-down pass to Max McGee fell incomplete. The Packer running game was limited to 90 yards on 26 attempts and, as a result, the Packers could find themselves out of first place in the NFC North for the first time all season, pending the result of the Bears-Vikings game later this week. Tomorrow: The ’99 Rams and ’02 Buccaneers meet in an important game for playoff positioning in the NFC; the ’00 Titans and ’79 Chargers try to take care of business against the ’64 Browns and ’91 Oilers, respectively, with their hugely important head-to-head matchup lingering in Week 16; the ’85 Bears try to move into first place in the NFC North against the ’73 Vikings; and the 9-4 ’91 Redskins travel to Irving to take on the 10-3 ’92 Cowboys. No biggie.